angon, 17 December 2018 – Through the introduction of energy efficiency and safety measures, the European Union (EU)-funded project, “Sustainable Freight Transport and Logistics in the Mekong Region”, has greatly improved the transport of dangerous goods sector in Myanmar. During the 3-year implementation, the project has worked closely with local companies, freight associations, banks and the national governments on such actions as eco-driving, adoption of fuel-saving technologies, enhanced access to finance for truck upgrades, green freight labelling and national action plans with the aim of ameliorating the environmental footprint of freight transport operations in the region. “Moreover, to implement the ASEAN Cross-Border Transport Agreement, Myanmar needs to improve its infrastructure, build the capacity of drivers, and strengthen its policy and rules and regulations for the transport of dangerous goods. In this regard, the Sustainable Freight Transport and Logistics in the Mekong Region Project has been instrumental in raising the awareness and capacity of the Road Transportation Administration Department (RTAD), which has successfully issued six notifications on transport of Dangerous Goods by road based on the European Union European Agreement concerning the International Carriage of Dangerous Goods by Road (ADR). 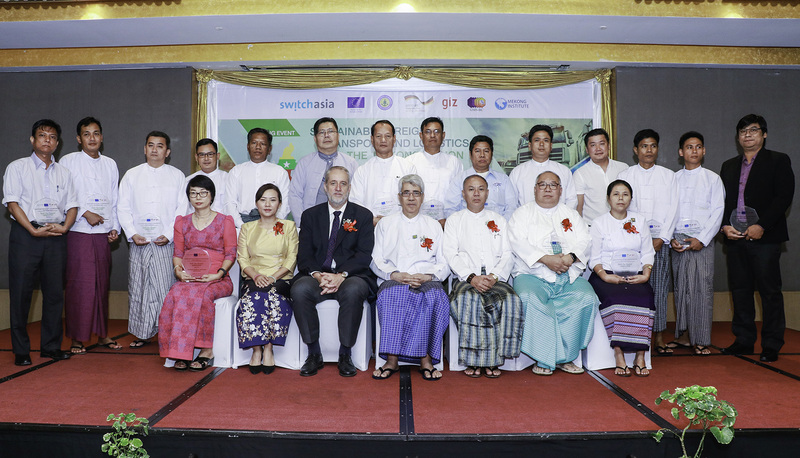 We are particularly pleased with the implementation of the programme in Myanmar and the good cooperation that we have seen between relevant government agencies, the freight transport SMEs, transport associations and service providers. This will facilitate cross-border trade and enhance economic growth in the future.”, Mr. Kyaw Myo added.